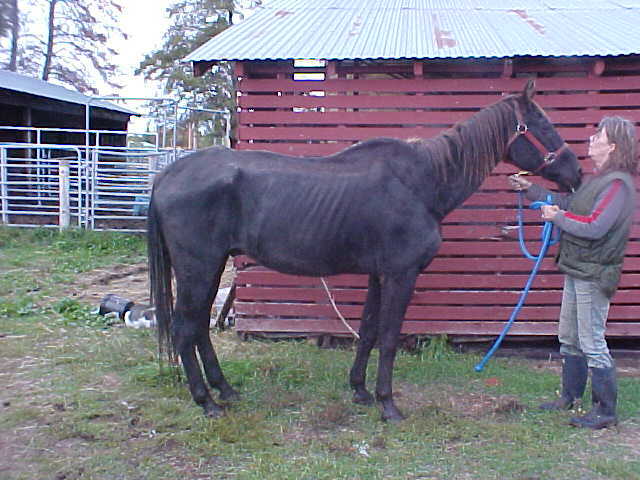 Pictured below are horses that went through rehabilitation here throughout 2008, and a few from early 2009. All of the horses below have found new homes. 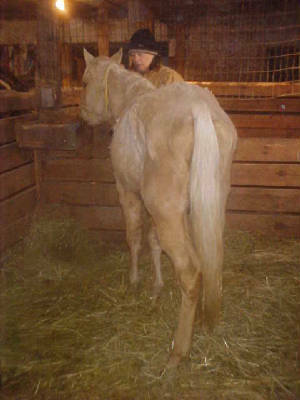 'Yeller: 12 year old grade QH gelding. 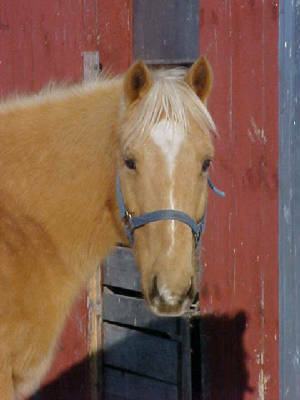 'Yeller is a gorgeous gelding that is in excellent shape and supposed to be well broke to ride. Unfortunately, about a year ago his foot went through the floor of the trailer he was riding in. 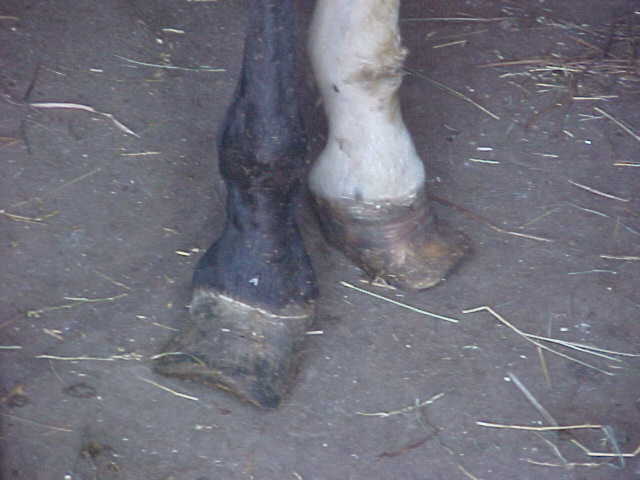 He spent 2 months at the vet's clinic after the accident and is doing well, he travels sound on his hoof but the damage is pretty scary to look at. 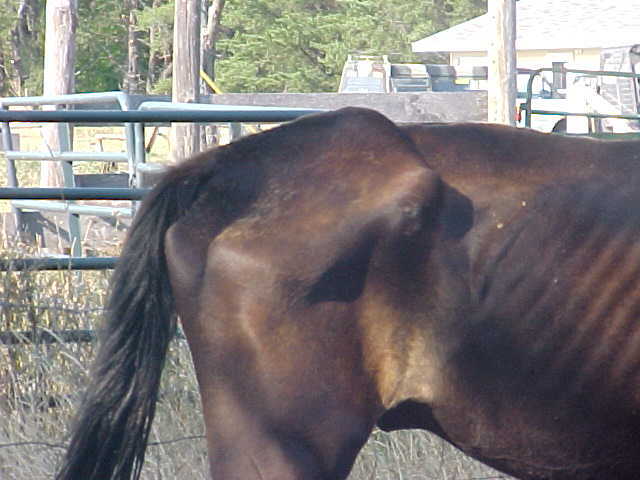 The crack goes all the way up, and is deep, we don't know that he'll ever be more than a companion horse. We plan to keep him here for a while to evaluate his hoof better. 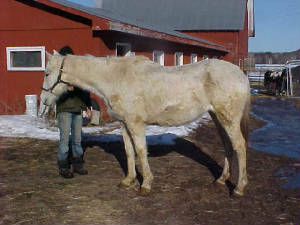 Our farrier will start working on him next week, (photos taken 1/27/09). 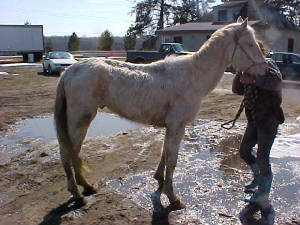 Update 2/18/09: Yeller has been looked at and trimmed by our farrier, who was not nearly as upset by his hoof as we were. 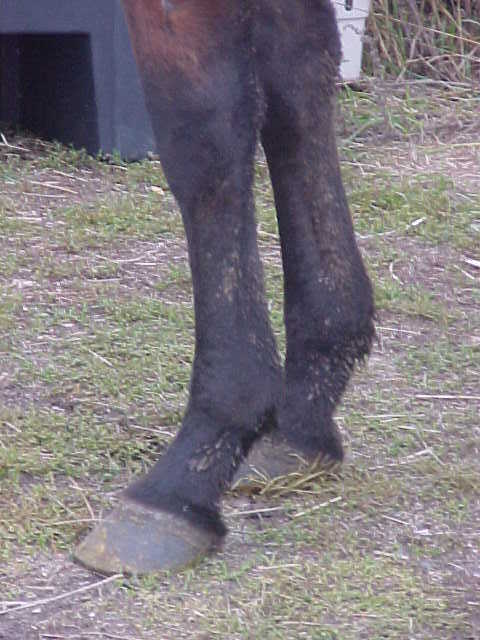 He thinks that he will be rideable (he is sound on that foot) and just needs time for one horizontal crack to grow out. The rest "is what it is" and will just continue to grow our scarred. Good news for Yeller! Update: Yeller has found a home! 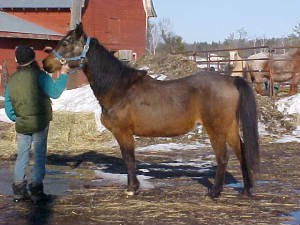 Strouba: 1982 bay 3/4 Arabian mare. Strouba needs weight and is getting over being sick. 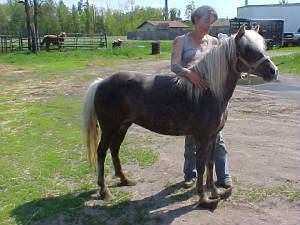 She is a sweet, small, Arab cross mare. We were able to trace "who" she is by her freezebrand, thanks to a friend's help. 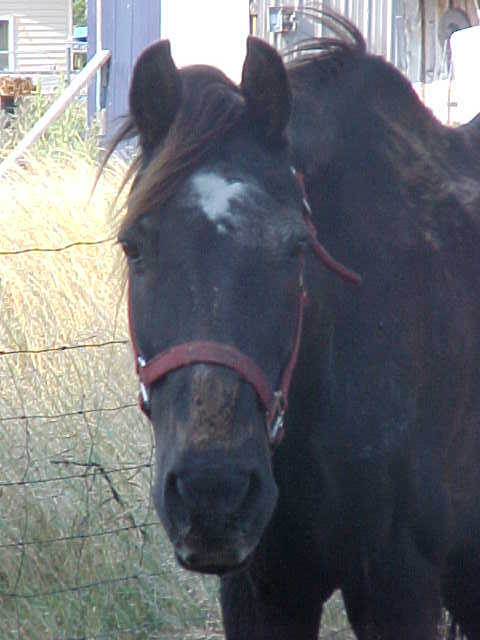 She has quite the permanent halter mark (in grey hair from scarring) on her face due to wearing a halter too tight, too long. :( Strouba is supposed to be very well broke to ride and appears sound. 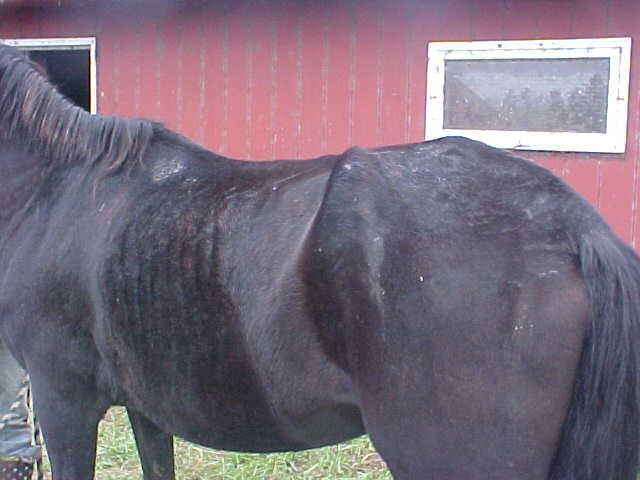 Update: Strouba has found a home that plans to finish her rehabilitaion and then retire her as a companion horse! 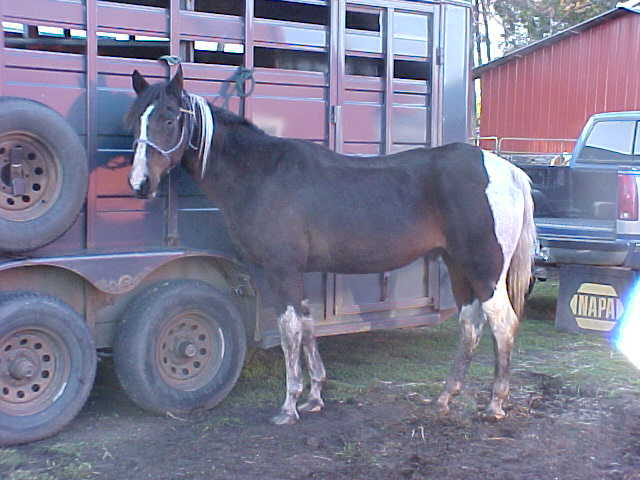 Photo taken 3/7/09, Strouba getting ready to get on the trailer to go to her new home. 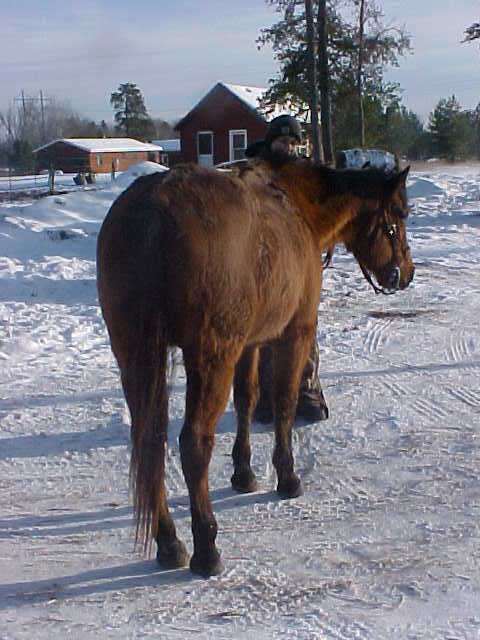 Starlight: 18 year old Thoroughbred mare. 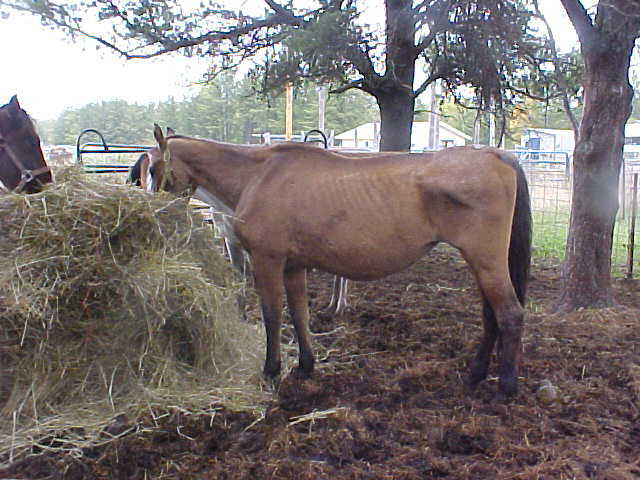 Starlight is a registered Thoroughbred mare, though her papers were thrown away as she was intended to be shipped to slaughter. 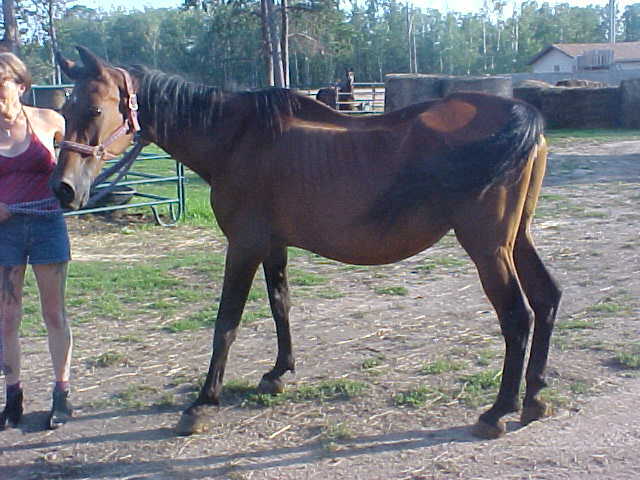 She is SUCH a sweet mare, and has had a lot of bad luck recently. 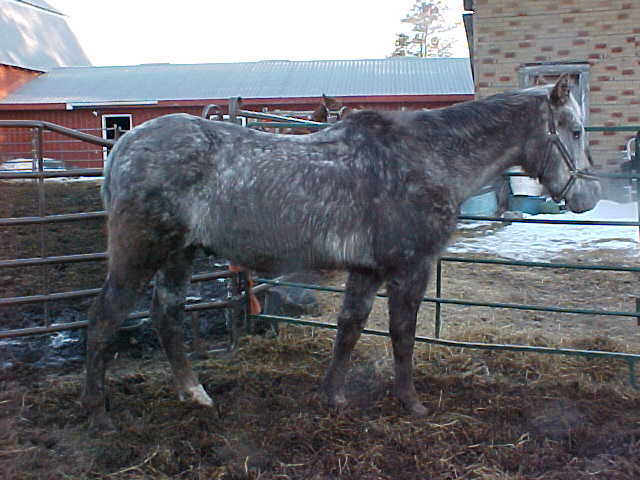 Blind in one eye and is lame in one front leg, thin and covered in bite marks. 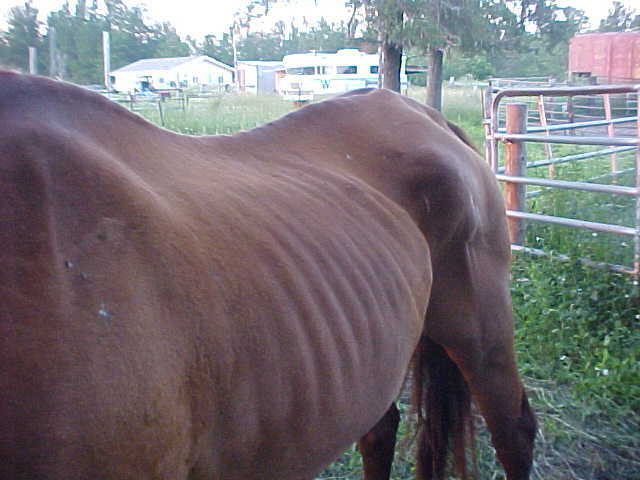 This mare has an excellent appetite and I'm sure it won't be too long before her weight is back. 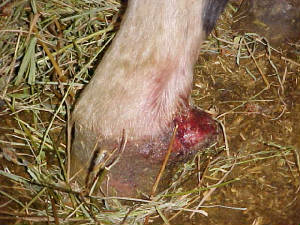 Will be having the vet and farrier look at her leg/hoof as well. Starlight loves attention and even nickers at us when she has a mouthful of grain. Loves to be groomed and is broke to ride, though we won't know for a while if she will be rideable or companion sound only. Photos taken 1/5/2009. 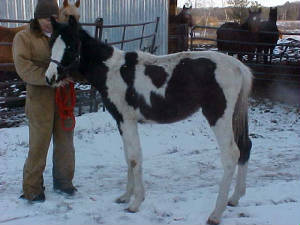 Malibu: 2006 solid Paint filly. 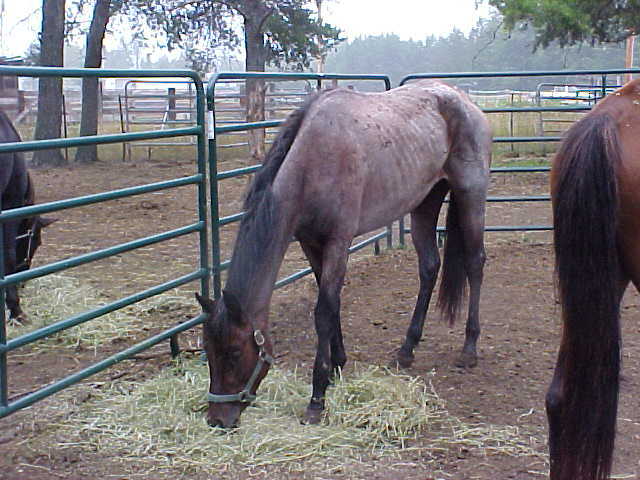 Malibu is a coming 3 year old registered solid Paint filly that is very small for her age. We don't even think she's 13 hands tall at this time. She is very sweet and friendly, we ended up with her as her previous owner had trouble getting weight on her. She's been here a few weeks now (these photos were taken today, 1/5/2009) and already put some weight on since she came home. She had an excellent appetite at first but is slacking off her feed a little off and on now and has been started on ulcer meds. 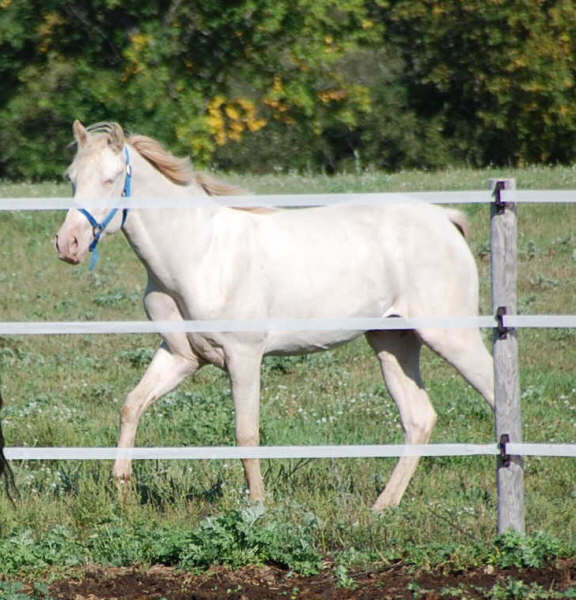 When she's ready for a new home she should make a good youth prospect and should be eligible for the American Paint Pony registry. 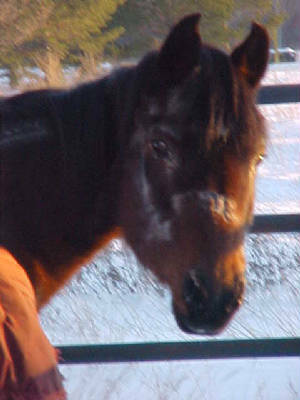 Ruckus: Yearling Arabian colt. 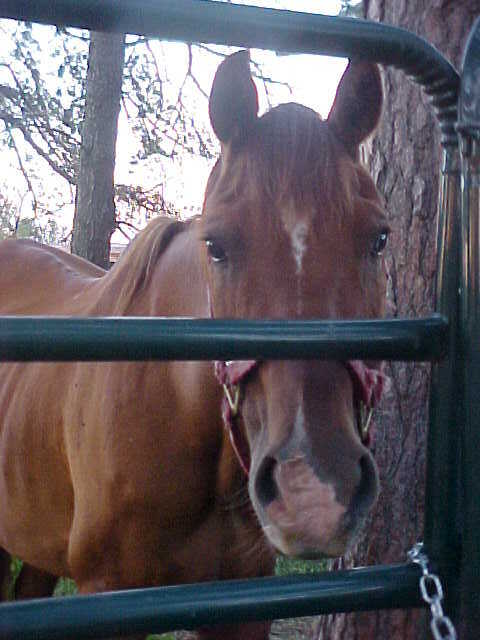 Ruckus is a very friendly Arab colt. He's a pretty boy with a good disposition. Not yet halterbroke but we'll be working with him on that. 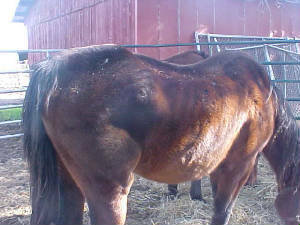 He has a wound on one hind leg that we are treating (photo taken 11/25), he will hopefully be ready for a new home soon. 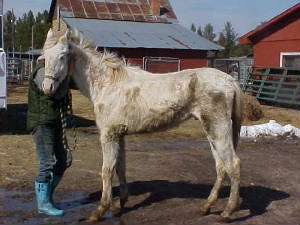 Scout: Paint colt, somewhere around 1 year old. 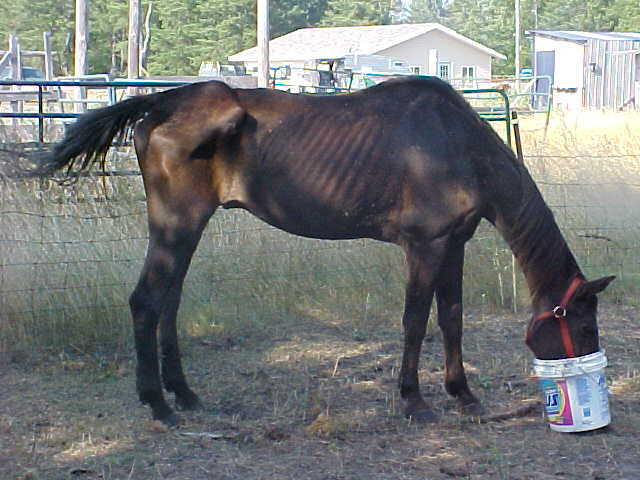 Scout is very malnourished. 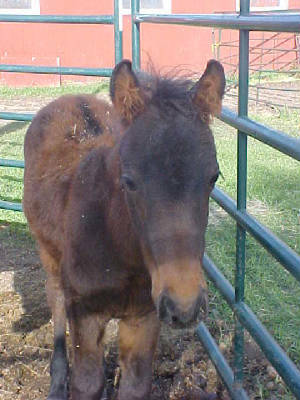 He needs quite a bit of TLC but is the sweetest colt. Photo taken 12-2-2008. His hind legs were very stocked up when we brought him home, that swelling has gone down and his appetite is picking up well. We are optomistic that he'll end up being just fine. New Scout pics taken 2/12/09. He still has a little ways to go but is looking much better, is much stronger and is the boss of Ruckus (who is much bigger than he is!). 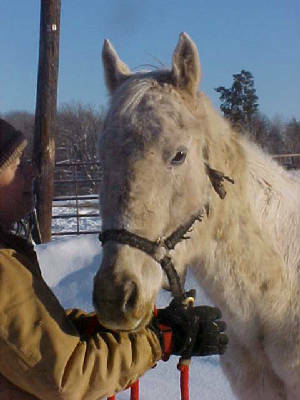 Jake: 20 year old pony gelding. 11/4/08: Jake's feet are horribly long and he will be getting his first trim here today. Will update with new photo after trim. 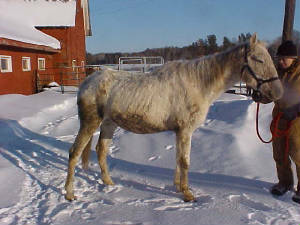 Jake is supposed to be well broke and is a very nice older gelding. Jake's feet after his first trim. Still has a ways to go to be normal, but took most of the length off and looking much better. 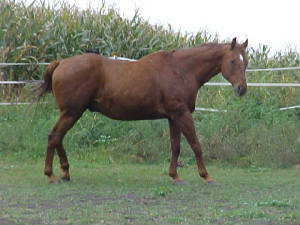 JD: 20+ year QH gelding. 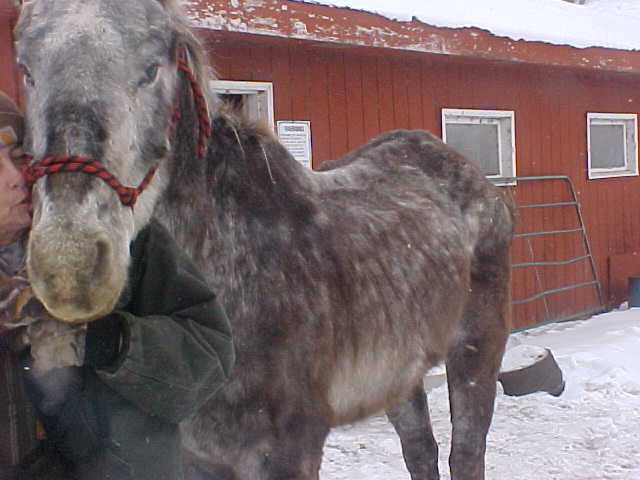 JD is a sweet old gelding who needs groceries. 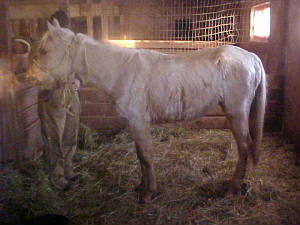 He looks to have a bit of a weak hind leg, we plan to have him examined (by the chiropracter/and or vet when one comes out). Very sad, kind eyes. Very nice boy deserving of a loving retirement home. Good appetite, eating sweet/senior feed mixed as well as soaked alfalfa cubes. JD is looking for a foster or retirement home, please email us if you'd be interested in taking care of this nice old guy. 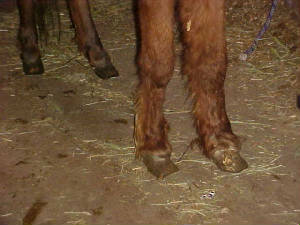 Update 11/3/08: JD's hind leg seems to be fine now, he appears pretty darn sound. We did ride him and he is well broke but definitely has some "pep" for an old man! 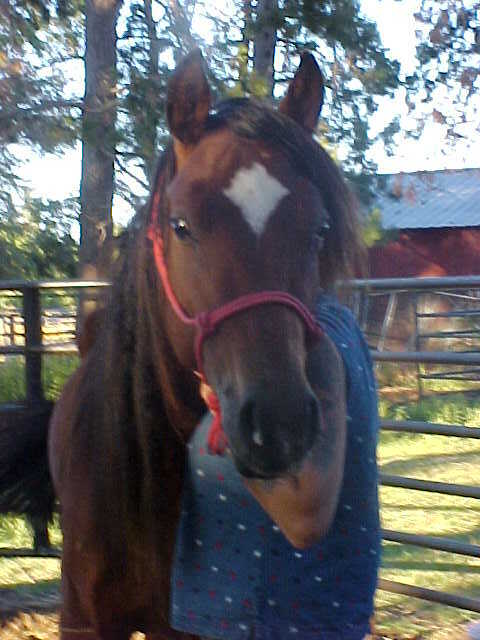 Due to his age he will be light riding sound only, and he is still looking for a foster or forever home. Update 11/16/08: JD has gained weight, is doing great, and has found a new home! 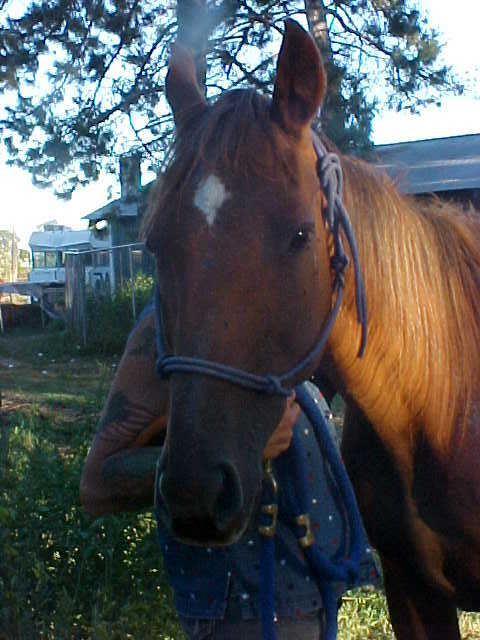 Whiskey: 20+ year QH gelding. 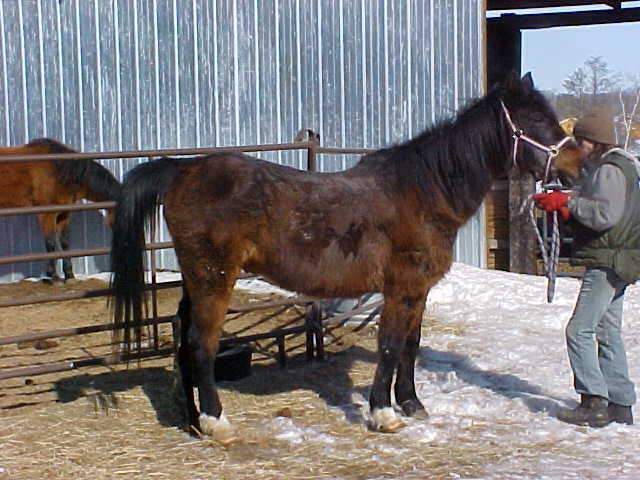 Whiskey came to us from a family that had him for many years and didn't want to take him to the sale barn. 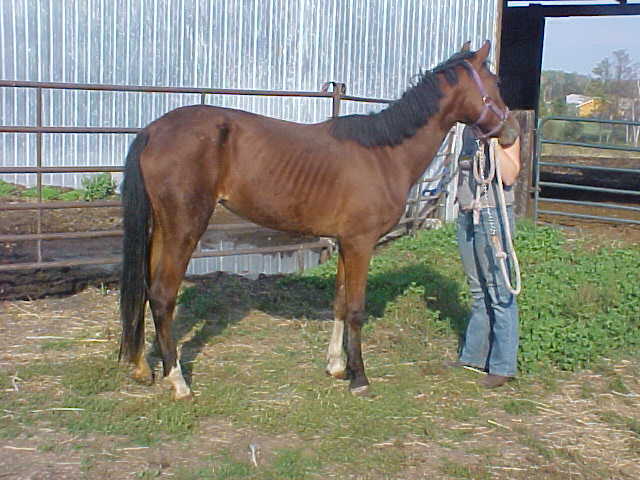 He needs some weight but is sound and healthy otherwise and supposed to be well broke to ride. Whiskey should be ready for a new home in a few weeks or so. Update: Whiskey has found a wonderful new home! 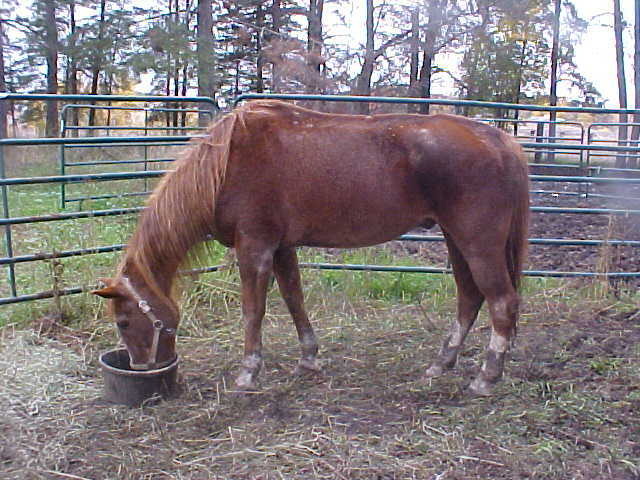 Hazel: 20+ year old QH mare. 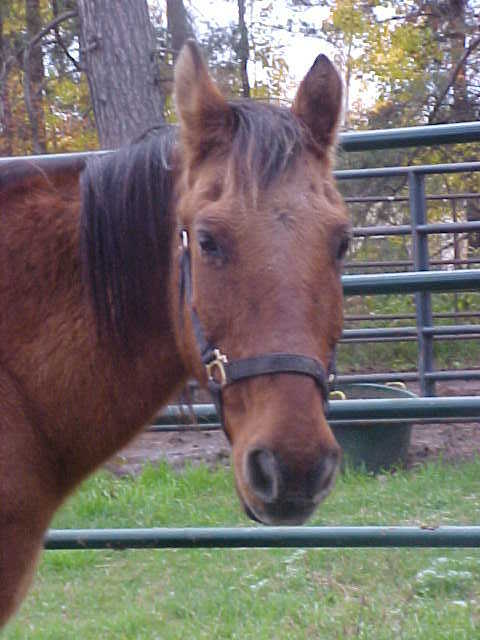 Hazel is a sweet, older mare in need of lots of groceries. 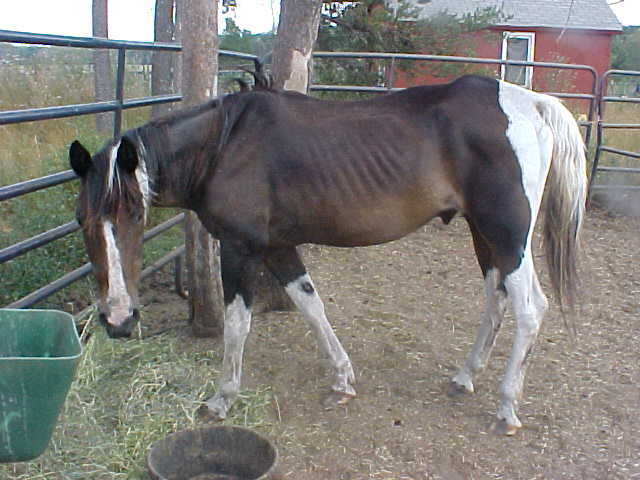 She appears healthy otherwise and is supposed to be well broke to ride. Photos taken 9/28/08. 10/6/08: Hazel has found a new home that is going to continue her rehabilitation and keep her for the family! Thanks Mary! 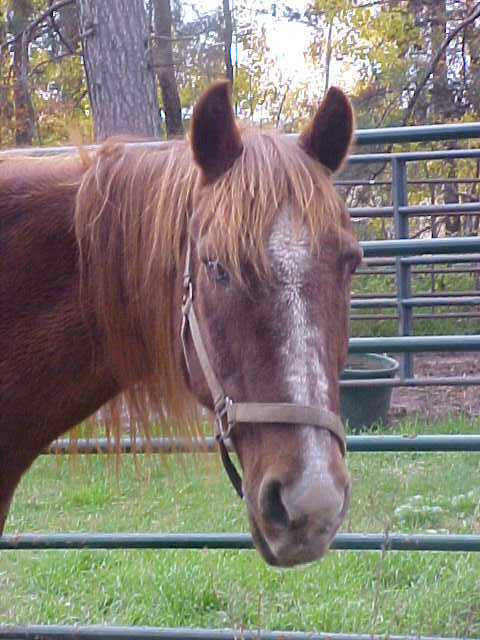 Molly Brown: 20+ year old Pinto mare. 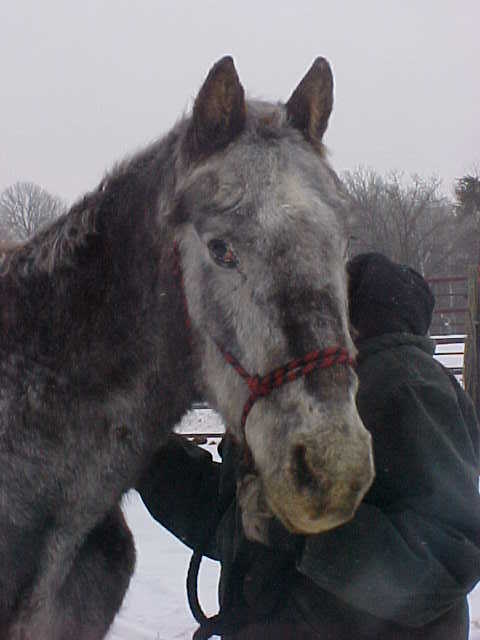 Molly is a former riding stable horse (Diamond T). She has a bump on one knee and is also going blind in her right eye due to a recent injury. 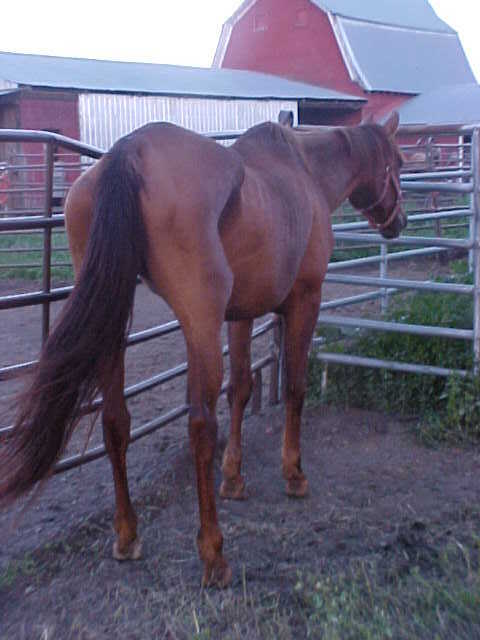 Molly needs a lot of weight but we've heard that she was an outstanding mare at the stable and very popular there. Photos taken 9/28/08. Update 10/28/08: Photo of Maggie (formerly Molly Brown) in her new home after 3 weeks. She looks great! 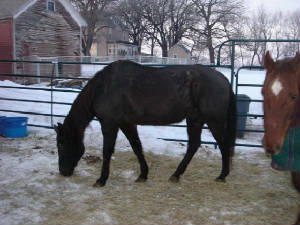 Tara: Aged black Arabian mare. Needs quite a bit of weight but has an excellent appetite. Supposed to be well broke and is freezebranded on her neck. Photo taken 9/28/08. Update 10/28/08: Tara has been identified by her freeze brand (Thank you DeEtta!) 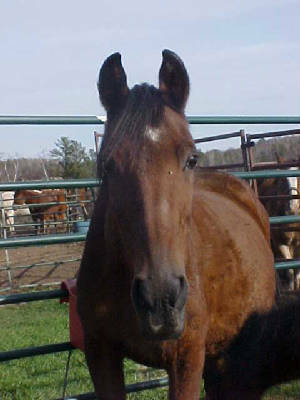 and is actually a 1986 mare named Sable Mystique. 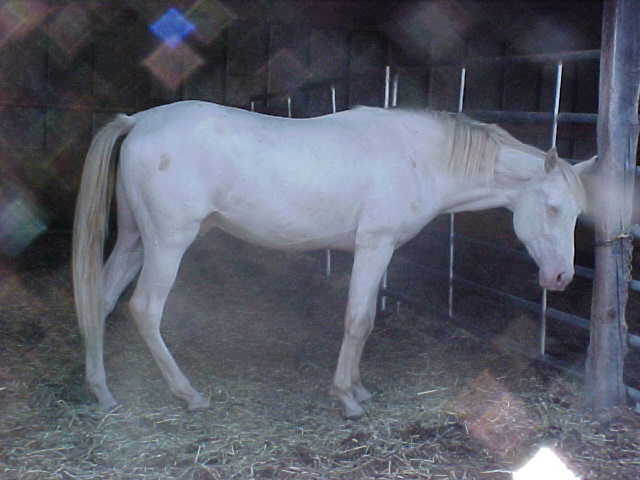 She was shown extensively at Arabian shows in the 90's in English, Western Pleasure, and Costume class. Update 11/18/08: Tara has gained a lot of weight and is doing very well. She left today for her new home! 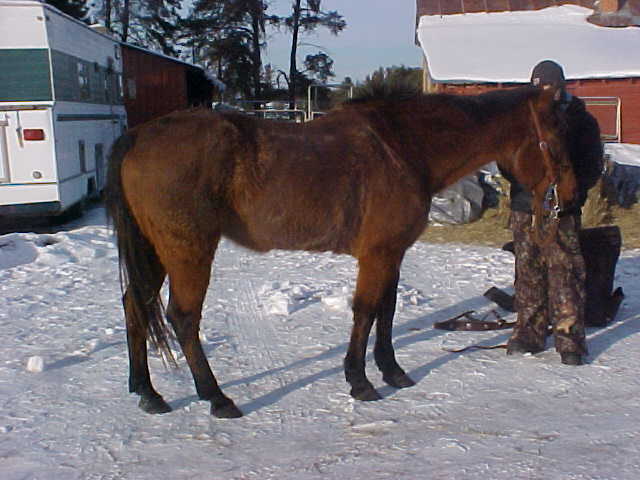 Dora: 4 year old Saddlebred mare. Dora needs a lot of weight but is young and appears healthy otherwise. She is very friendly and it's obvious someone weaned a foal off her not too long ago. We were told she may have been started under harness. Shouldn't be too long until she's ready for a new home. 10/14/08: New Dora photos. She has been dewormed and eating well and is putting on weight nicely. Will be ready for a new home soon. She will still need a little weight but is young and healthy and gaining quickly. 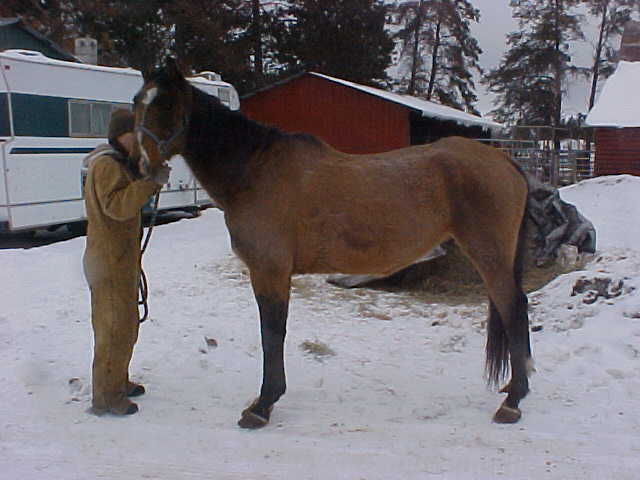 Pappy: Aged QH gelding. 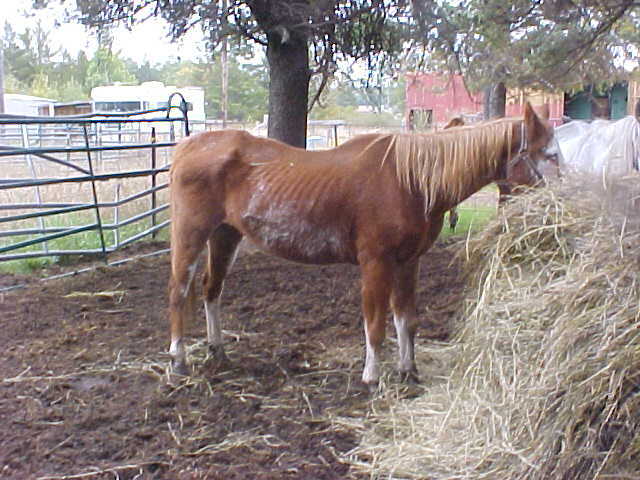 Pappy is in as bad condition as any horse we've ever had here. He is very emaciated and is missing hair all over. Photos were taken 8/29/08, we brought him home 8/22/08. He went down that weekend while we were gone, (a friend was here and tried to help him up). Thankfully he was able to get back up later in the day and he's been doing good since then. Very bright eyes, good appetite, excellent disposition. Pappy has a long road to recovery ahead. 9/29/08: Pappy has an excellent appetite and is making slow but good progress. New photo coming soon! 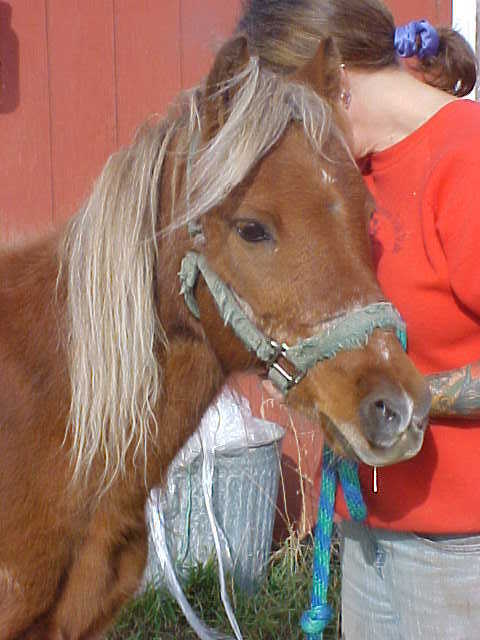 Thank you Kathy for helping sponsor Pappy and the other rehab horses! Photos of Pappy taken 10/7/08. He has gained a ton of weight and no longer has bald spots. His rainrot has almost completely cleared up and he's doing great! His feet need quite a bit of work, he has recently been trimmed but will need for them to grow out before we can do more. 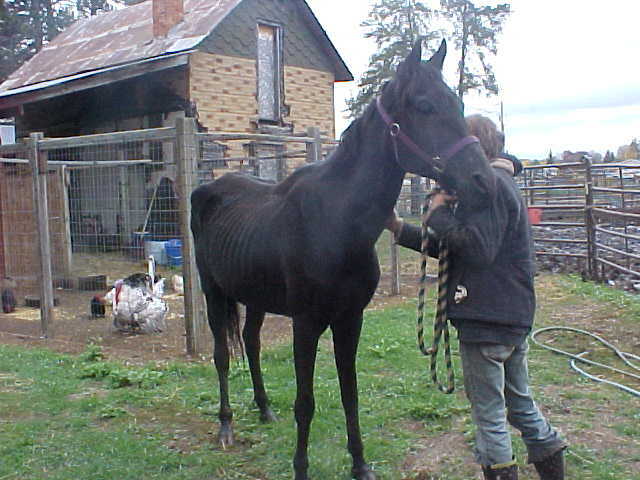 Update 10/28/08: Pappy has been placed in a home that will continue his rehabilitation. 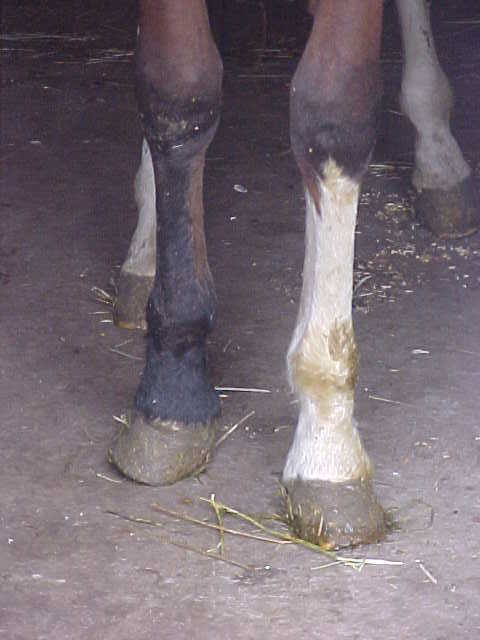 He's well on his way back to looking like he should but will need a lot of hoof care. He already has a potential home lined up for when he's ready to be adopted. Pappy 1 year later! Photo taken October, 2009. He could now stand to LOSE a few pounds! 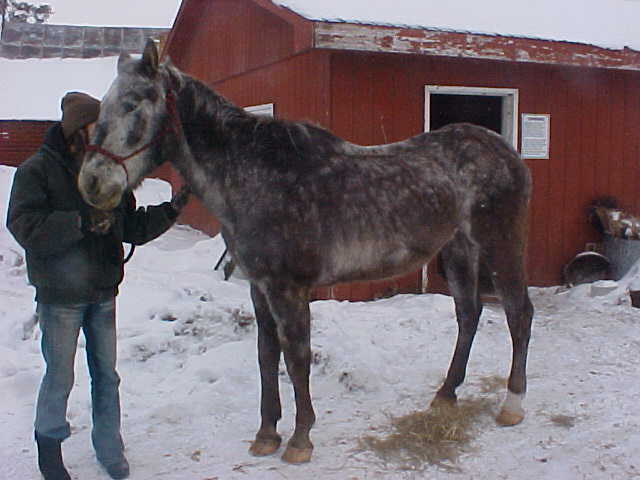 Lance: 3 year old Arabian (Arabian cross? We aren't sure) stallion. We brought Lance home the same day as Pappy. 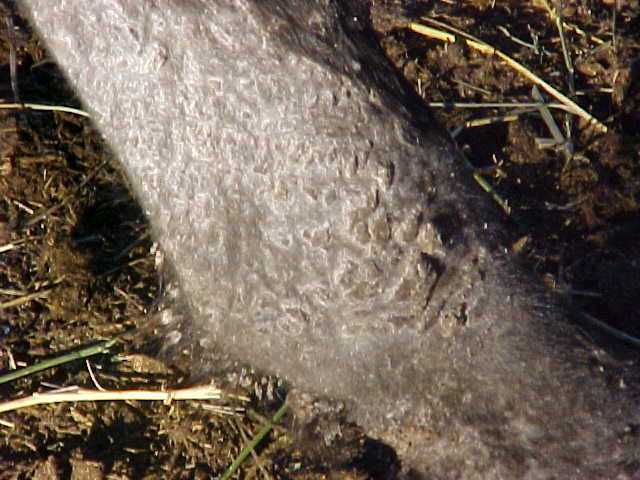 He is very thin and is missing hair (has some sort of fungus on his legs, the close up photo shows it). He is being medicated and has an excellent appetite. Lance is a bit of a crabby boy, we're hoping that changes with time (and gelding him as well when he's healthy enough for it). 9/29/08: Lance's leg fungus is all gone and hair has grown back. He is slowly gaining weight. New photo will be posted soon! New Lance photos taken 10/14/08. Lance is still slowly but surely putting on weight and becoming a nicer fellow. ;) All the hair is back on his legs, the fungus is gone and he is doing very well. 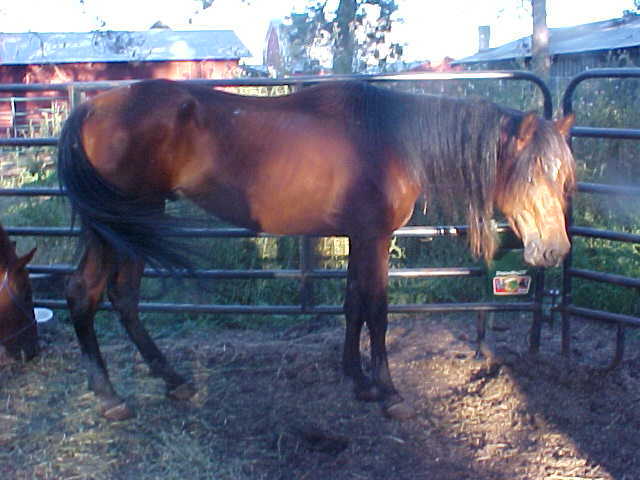 When he gains a little more weight he'll be gelded. 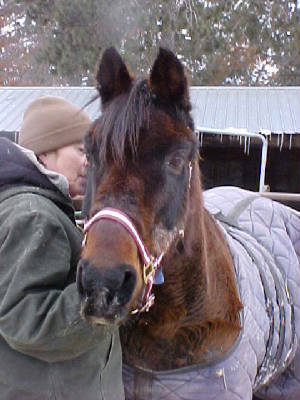 11/16/08: Lance was gelded this week and is now ready for his new home! 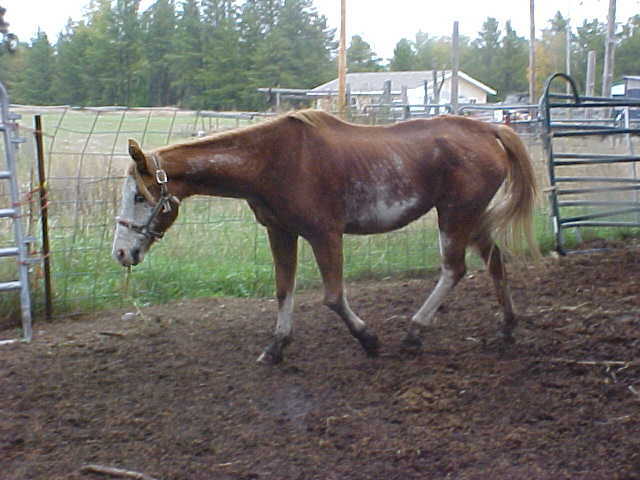 Cutter: 20+ year QH gelding. These photos were taken around Sept. 1st 2008. 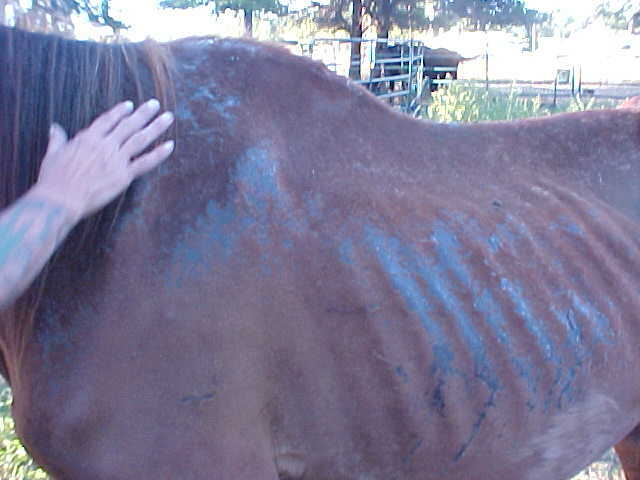 This is a horse that we placed in a home where we thought he would be fed what he needed (which was clearly explained). We were never contacted to be informed that he was not doing well, and we dropped the ball by not checking on him ourselves. We just assumed everything was fine based on the emails that we did get. We will never let this happen again, and plan on requesting photos and/or us dropping by to visit, to make sure the older, hard-keepers are being taken care of properly. 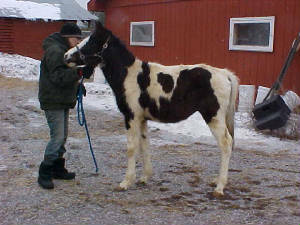 Cutter has now been with us about a month and the photos will show the weight he has already gained since coming here. It may take as long as 4 months for us to get him back to where he should be as he's a slow weight gainer, but has an excellent appetite and will to live. We feel terrible that this happened to Cutter and blame ourselves completely for not looking in on him. It's a hard lesson learned and we don't plan on letting it happen again. 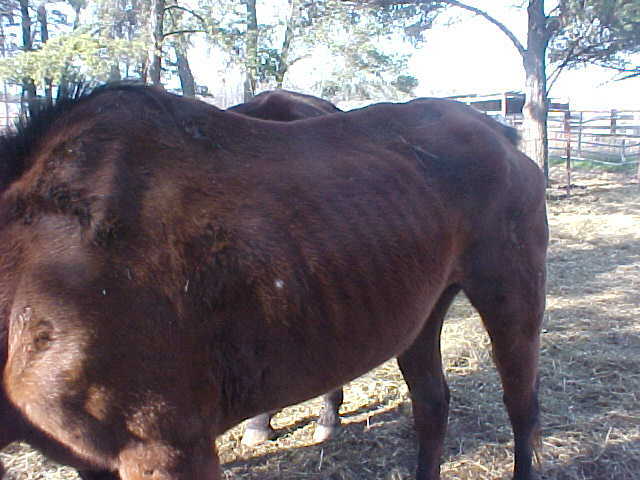 Also worth mentioning- while they didn't contact us about Cutter losing weight, they did have their vet out. The vet couldn't find anything wrong with him and it sounds like he thought he was just old; so being thin was normal? At the end they were feeding him only soaked hay cubes (no grain) by the vet's recommendation! 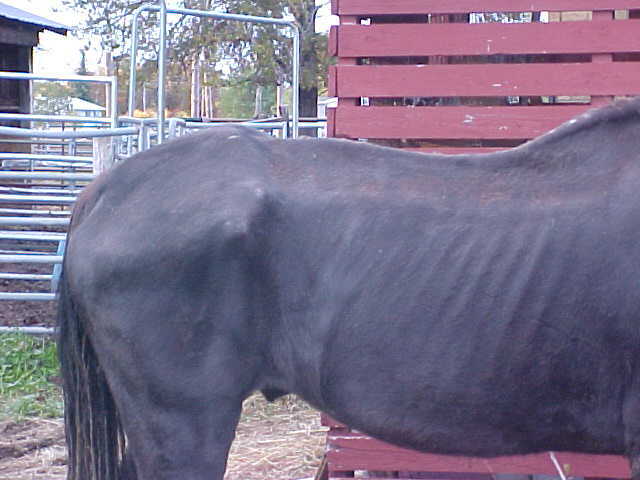 We're finding more and more vets that seem to think that because a horse is old, it's OK for it to be thin. 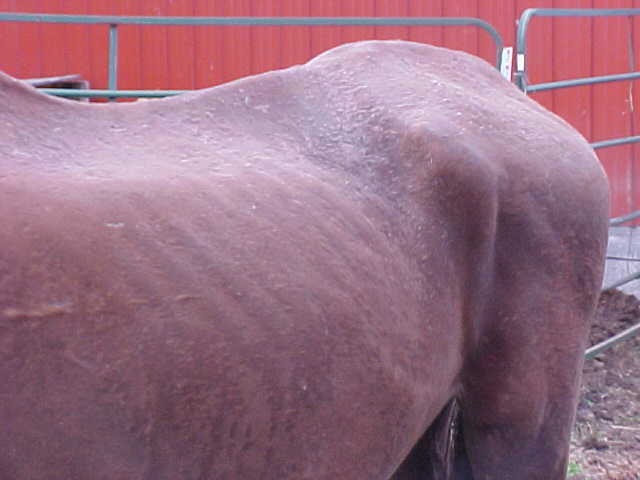 Well, if you have an older horse that is thin- and it has no health problems and a good appetite- you are simply not feeding that horse enough. Cutter is getting 18lbs of grain a day, as well as alfalfa hay and soaked cubes. He will always be an expensive horse to keep weight on, that's just him. New Cutter photos taken 10/7/08. 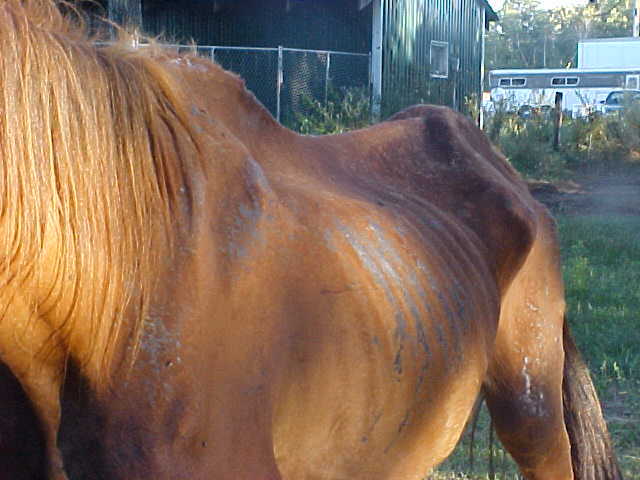 Update 10/28/08: Cutter has been placed in a home that will continue his rehabilitation. He is doing very well, it will just take time for him to finish gaining the weight he needs. He already has a prospective home lined up for when he's ready to go. Update: 2/1/09: New Cutter photo taken January, 2009. He looks great!! 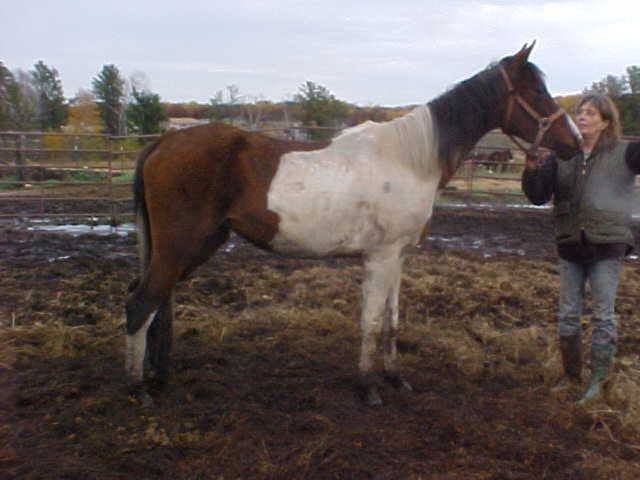 Poncho: Aged Paint gelding, former mounted patrol horse. 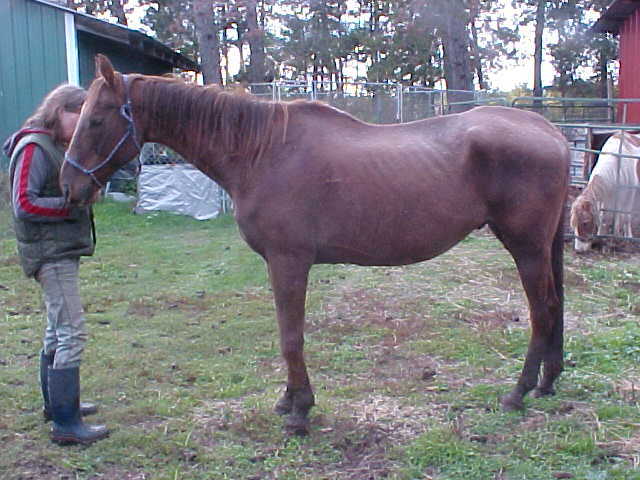 Poncho is a very sweet gelding who has an excellent appetite and is well on his way to getting his weight back. These photos were taken the day after we got him home, will have updated pics within the next few weeks. He is sound and healthy, just was not being fed the amount he needed. 9/3/08: Poncho is doing well and steadily gaining weight. He has also found a sponsor, thank you Pam! Photos of Poncho taken 10/7/08. Poncho is doing awesome and is ready to start looking for a new home. Update: Poncho is in his new home! 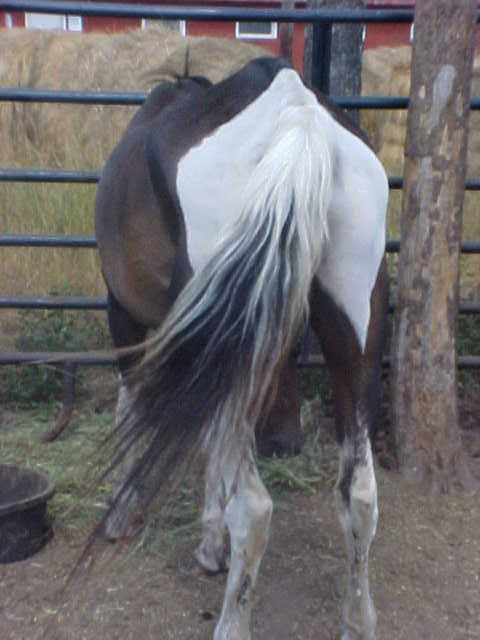 Charm: 20+ year QH mare. 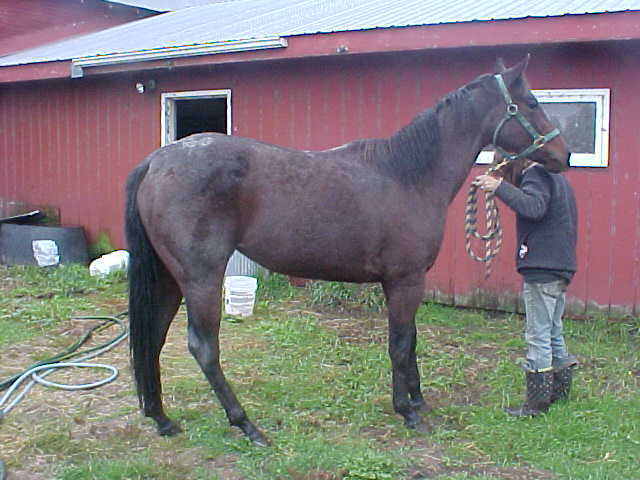 Charm is a recent aquisition from the sale barn. 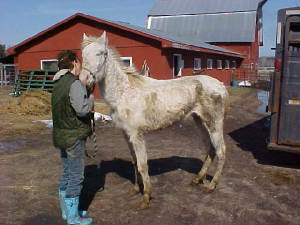 She was out on "poor pasture" (obviously no one cared enough to bother giving her grain) and is such a kind, kind mare. Very gentle, very happy to be getting food she can eat. Charm is supposed to be well broke to ride- I'm sure she is but it will be a while before we evaluate her under saddle. She's eating well and is on her way to getting her weight back. Photo of Charm taken 9/1/2008. Charm is looking much better and is ready to go to a new home! Update 9/25/08: Charm has found a wonderful new home! 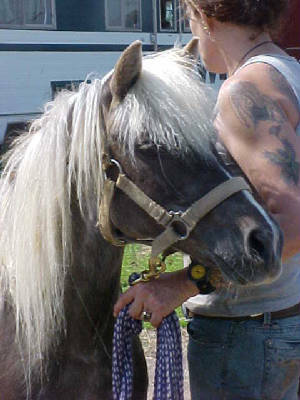 Tootsie: Beautiful classic Shetland pony mare. She is supposed to be broke to ride and has an excellent disposition. Obviously her previous owner didn't feel the need to keep her feet trimmed, but after a few trims here and a little time she'll be just fine. Tootsie's feet after one trim, 6/6/08! No signs of founder but the farrier felt it had been approx. 2 years since she'd been trimmed last. And Tootsie has found a home already! 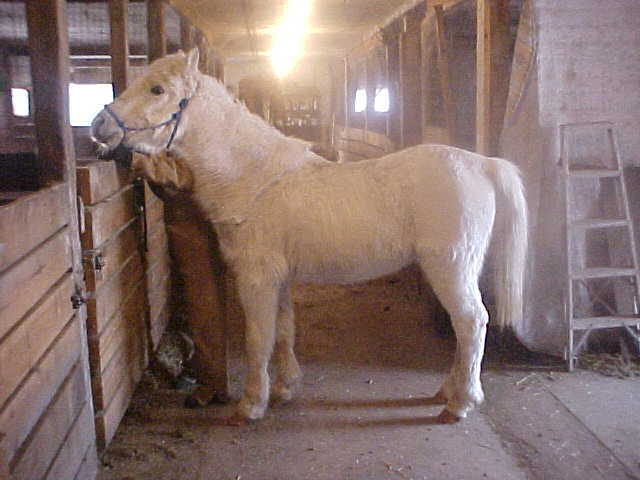 Mickey: 2 year old grade cremello stallion. (Yes, Mickey was hiding something from us!) 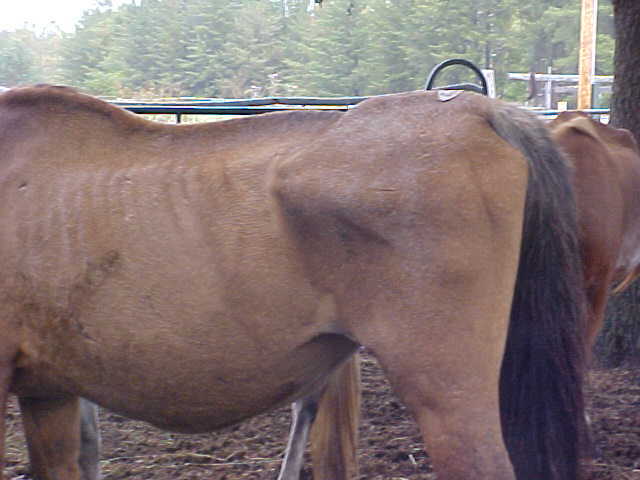 I tried to get the photos at an angle where you could see just HOW thin this guy is- he has absolutely no meat or muscle to him and is very weak and unsteady in back. He is bright eyed though and we are hopeful for him. 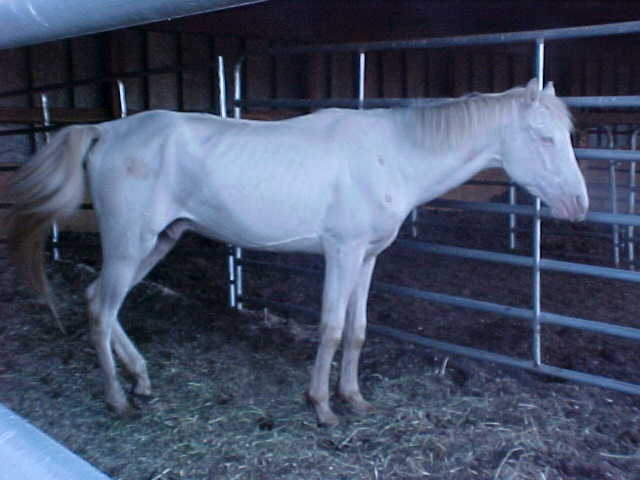 This poor horse was actually purchased by a kill buyer and then given to us to rehab and find a home for. Whomever his last owner was obviously didn't give a ****. Update: 4/26/08. Thank you Marci and Mel for your donations to help Mickey and thank you Mel for your sponsoring him and offering to provide him a home when he's ready for it! 6/25/08: New photos of Mickey! He still has a ways to go but is gaining weight steadily and looking much better. Update 7/29/08. 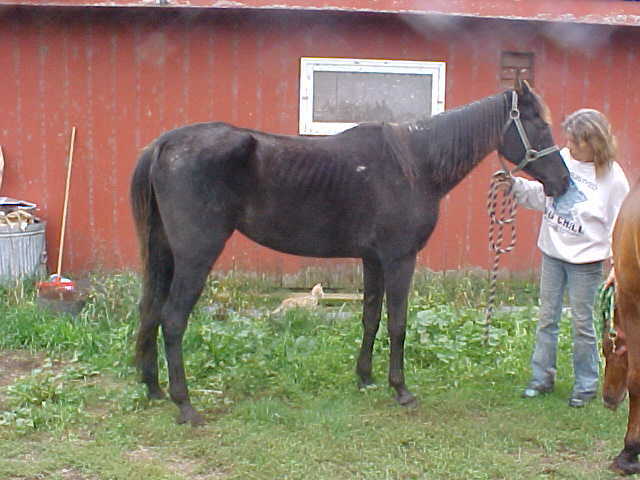 Mickey has been gelded and continues to gain weight. He'll soon be moving to his new home! New photo coming soon. Photo of Mickey (now known as Lucky) taken 9/1/2008. 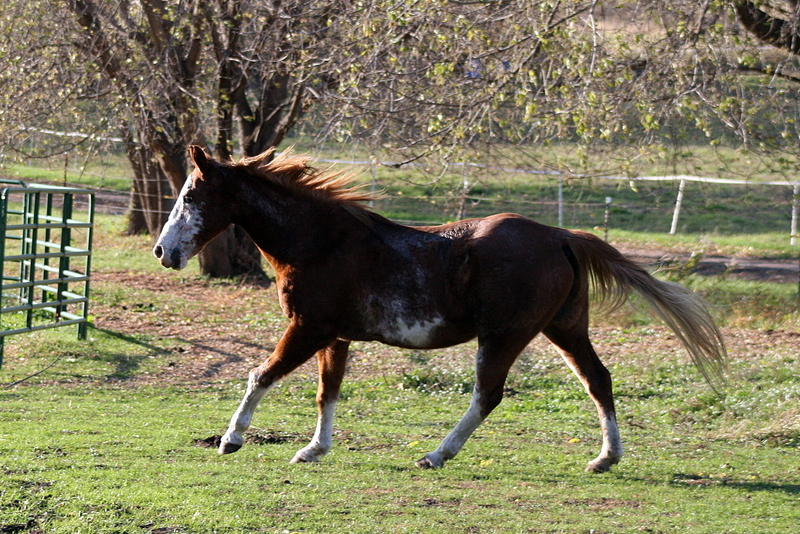 He has made great improvement and is 10x the horse he was when we brought him home. Mickey (aka Lucky) in his new home, Sept. 2008. 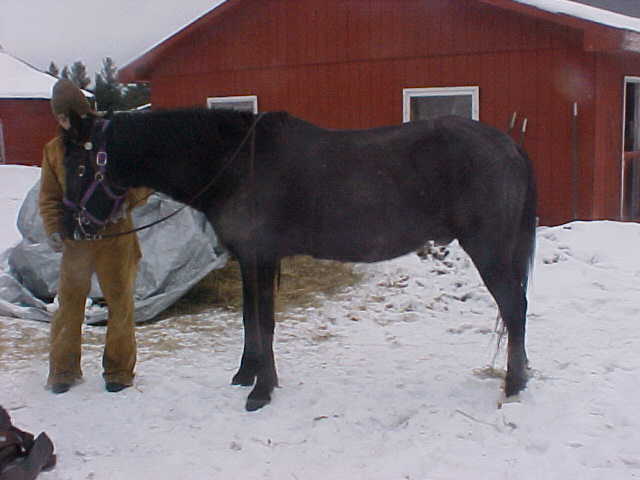 Duke (aged bay Arab gelding) and Duchess (aged POA mare). Duke and Duchess were purchased at auction the end of January. They came from a riding stable and are both well broke to ride. Duke is very thin, but sound and healthy otherwise and has an excellent appetite. Duchess is a bit thin and her appetite wasn't the best, though it's getting better. Update: 3/6/08. Duke is ready to be evaluated and will be looking for a new home soon. Duchess and Sweet Pea both have found a home with an equine retirement group! 3/10/08. Duke was evaluated and found ready for his new home, fortunately since he and Sparkle are penmates and the best of friends, the folks taking Sparkle home decided to take Duke as well! 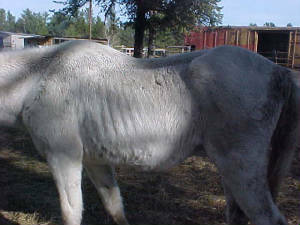 Please welcome "Silver" to Great Expectations Ranch. Silver was purchased at an auction on 12/29/07. 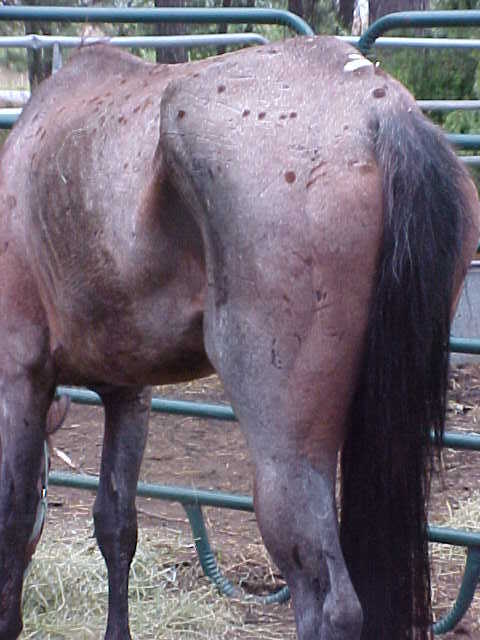 He is an aged Appaloosa gelding and has already won us both over completely. What a kind horse! 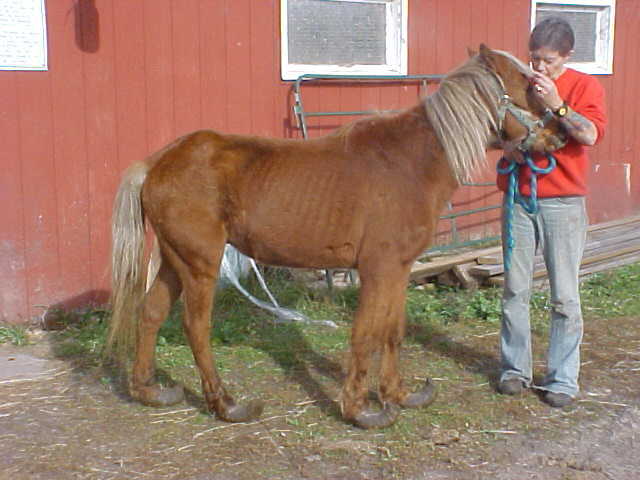 He has a great appetite and appears healthy, just extremely neglected. Update: 4/1/08. 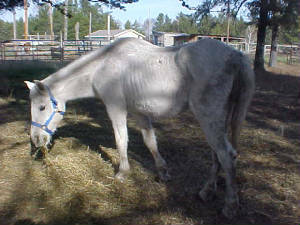 Silver has gained quite a bit of weight, is doing very well and will soon be ready for a new home! Update: 4/13/08. 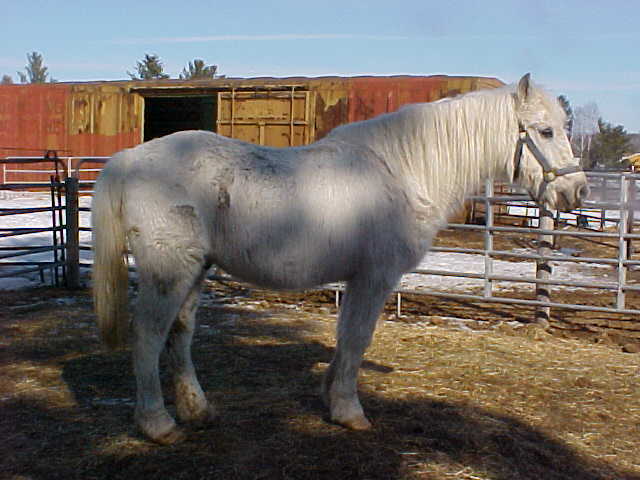 Silver is now ready for his new home and is listed on the "rescue horses" page! Update: 4/15/08- Silver has found a home! 12/27/07. 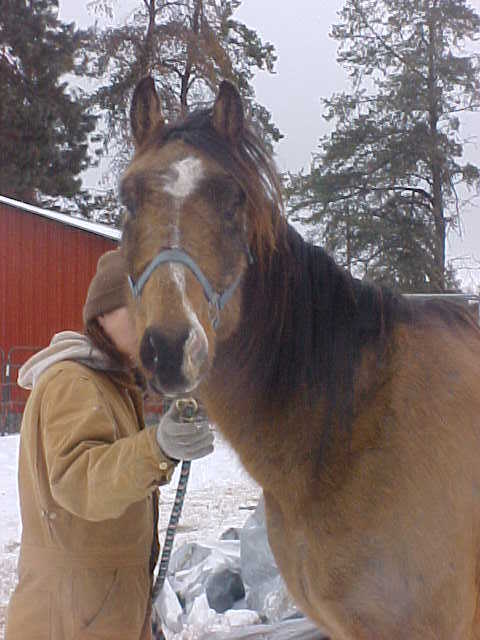 Garth is a 6 year old QH gelding that we bought at an auction a month and a half ago. He's gained some weight already but still has a ways to go. He's a big, tall guy and it will take him a little while to fill out. Excellent appetite, nice gelding, we were told he was broke to ride and will be evaluating him further soon. Garth will hopefully be ready for his new home shortly! 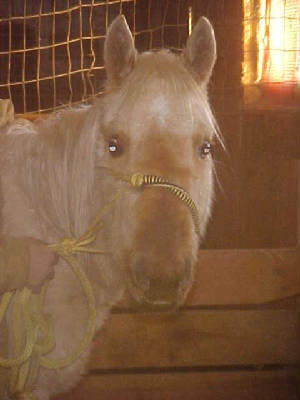 Update 2/3/08: Garth is now ready for his new home and is listed on the "rescue" page. 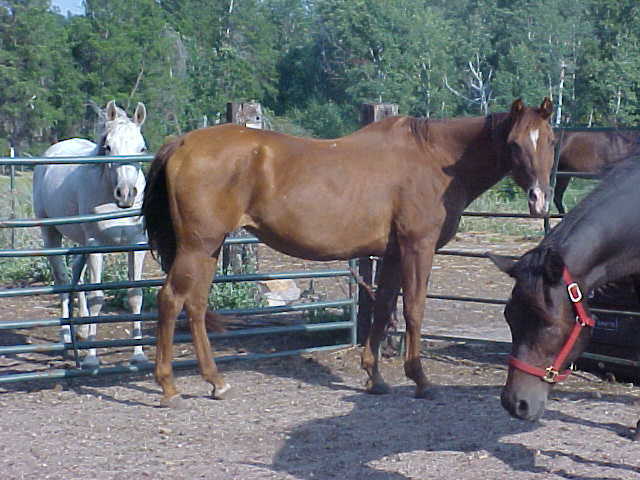 Cisco, Sparkle and Ben: All 20+ year old geldings. Photos taken 11/1/07. These boys came from the auction, along with Owen and Ace (Ace has already been placed). They were all owned by the same family and we were told they were at auction from either sheriffs forced sale or H.S. seizure/sale. 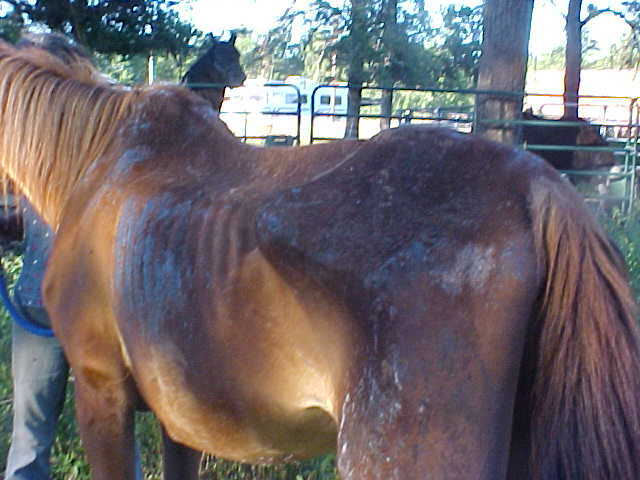 It infuriates me that horses period, but especially this good, (all are very well broke, gentle horses) were allowed to get into this condition. There is no reason the family could not have easily sold/found homes for them when they were in better shape, instead of letting them slowly starve to death. Keep in mind they have a good start on their winter coats already so are even thinner than the pics show. Ben is in the best shape of the three and it won't be too long before he's ready to look for a new home. 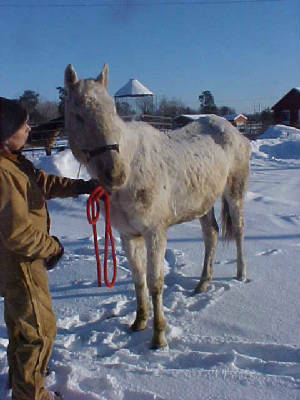 Ghost is in the worst shape of the group and upon buying him, had little energy and will left. 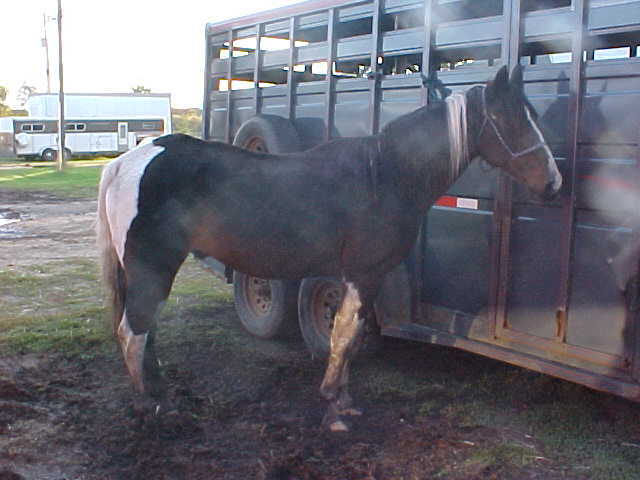 He stumpled to his knees loading into the trailer and we were not confident that he'd come around for us. However, in the 6 days we've had them home, he has perked up dramatically and nickers when he sees us coming with feed. His eyes are much brighter and we are much more optomistic about him. All three are happily eating their senior feed and hay and seem to be doing well. We've found no health issues so far, it just seems like a straightforward case of neglect. There's no excuse for the lack of care these boys were recieving. Update: 11/8/07. All three boys are doing well so far. :) Seems Mom changed Ghost's name to "Sparkle", lol (what was wrong with "Ghost"??) Anyway, "Sparkle" he is now! Update 12/21/07. Ben, Cisco and Sparkle are still gaining weight well and looking much better! And Ben has found a home!! Update 1/3/08. New Cisco pics! Cisco has gained a ton of weight, still has a little ways to go but is now ready for his new home and listed on the "rescue" page! 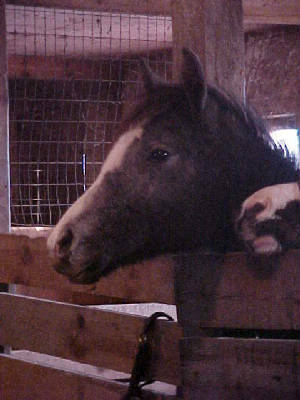 Update: 1/27/08: Sparkle is pretty much back to full weight, full of himself, and now listed on the "rescue page" and looking for a home! 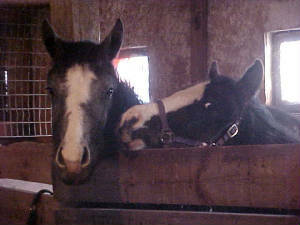 March 10th, 2008- Sparkle is looking great and has found a home along with Duke! Update 12/27/07. Bones is looking for his new home now and is pictured on the "rescue" page! 1/05/08: Bones has found a home!! Lucky has found a home! Lucky: Yes, that was actually already her name when we bought her! 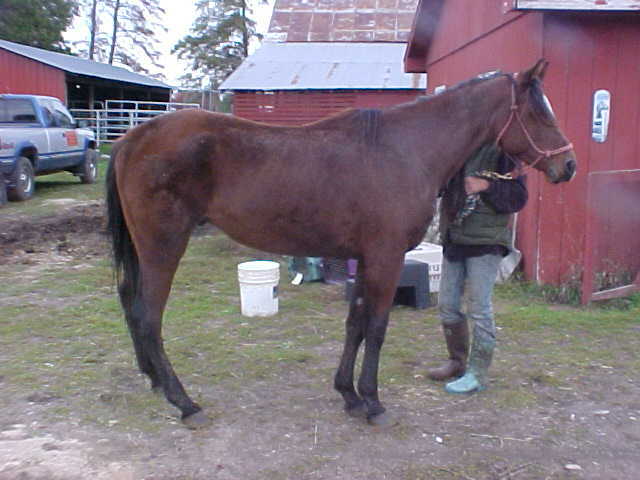 2 year old Thoroughbred type filly. 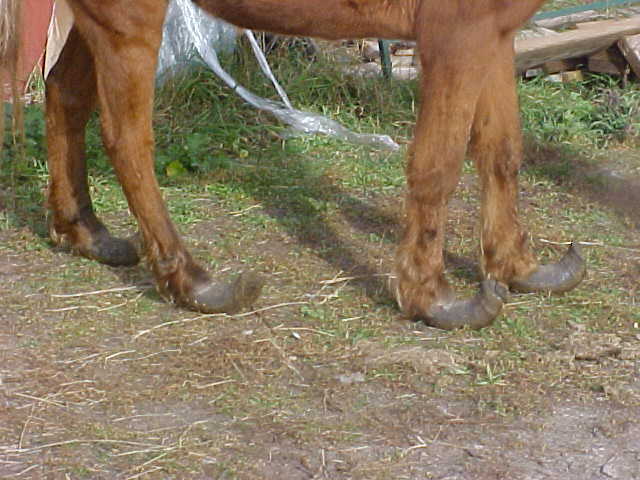 Needs a lot of weight and serious farrier work. We just brought her home 9/21/07. 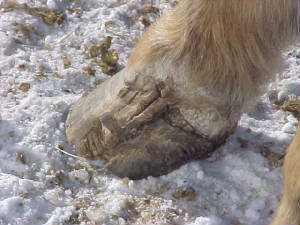 And imagine this- the man that had her recently bought her 3 months ago and has been having his farrier slowly work on her feet! So they looked even worse that this 3 months ago. :( We don't know if it's just neglect or theres a birth defect also involved, but we'll be having the vet and farrier both check her out. 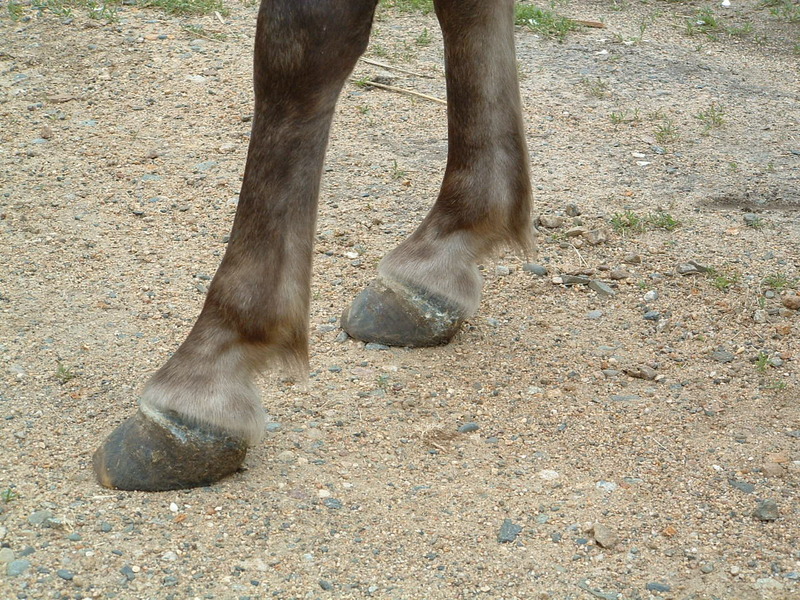 UPDATE: Our farrier feels that Lucky's hoof condition was caused mainly by neglect and is optomistic about her future soundness. 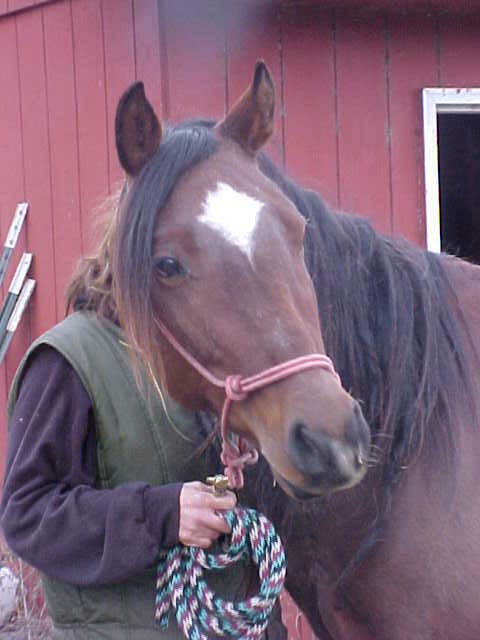 We have listed Lucky on the "rescue horse" page and are willing to adopt her out to a knowledgeable, loving home that is willing to take on and continue her care. 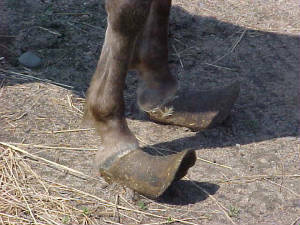 She needs feed and correct, consistant farrier work. 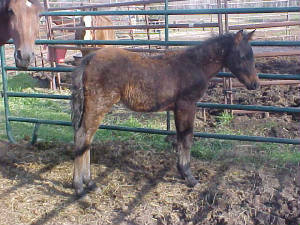 I'm betting in a few months she will be unrecognizable from the filly we brought home. Annie and Dan have found a home! 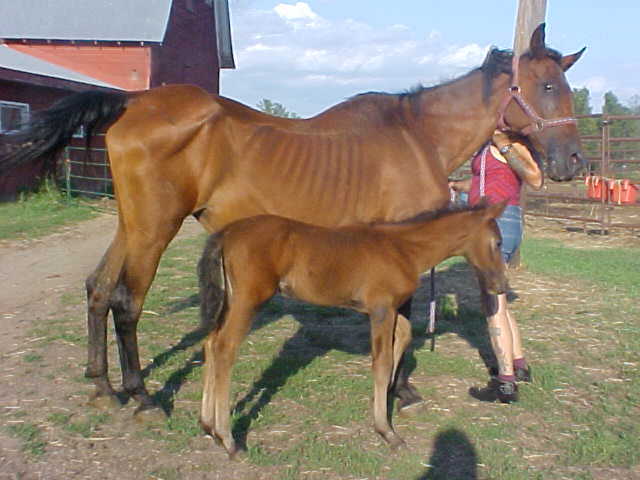 Annie and her colt: Annie is an approx. 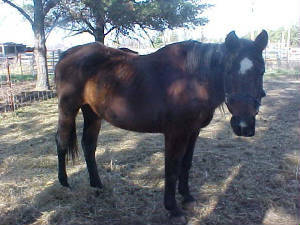 20 year old Mustang mare who is a sale barn rescue. 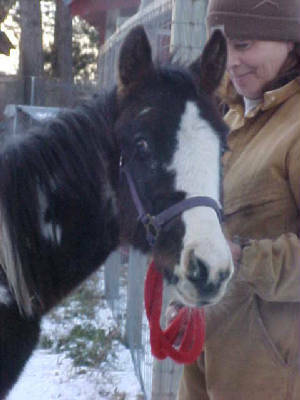 She was an Amish horse and this photo was taken a week after we brought her home. Rough, rough shape. 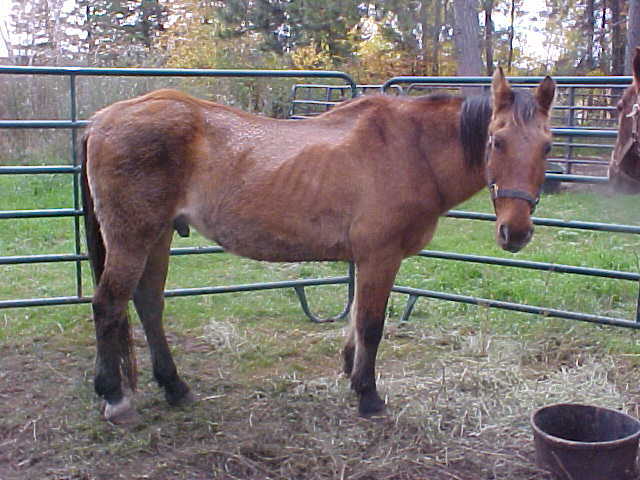 She had a definite will to live and an excellent appetite though and has already gained a *lot* of weight, in another month or so she'll look like a whole new horse. 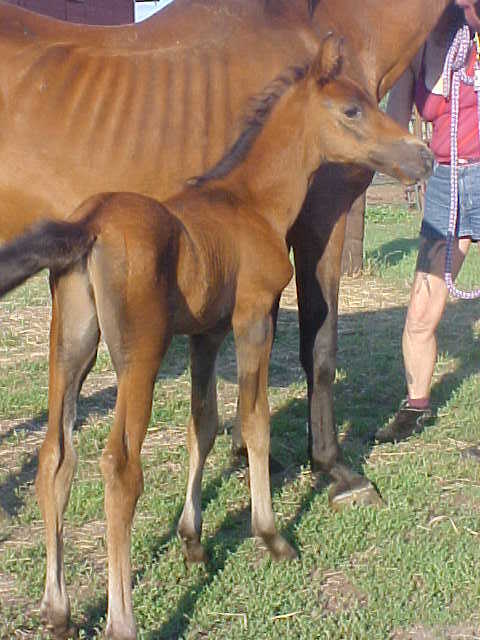 Her colt is adorable, best guess is that his sire may be a Standardbred. He's small for his age but I'm surprised he did as well as he has, considering how neglected his dam was. These photos were taken 8/31/07. UPDATE 11/1/07. 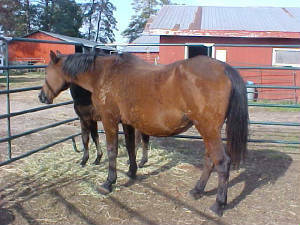 Annie is gaining weight well and starting to look like a brand new mare. She and Dan will soon be looking for new homes! Poco has found a home! 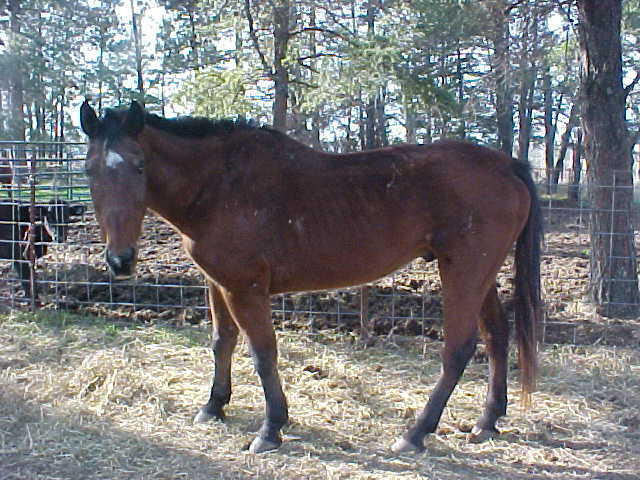 Lucky Blue Poco: 2004 bay roan AQHA mare. 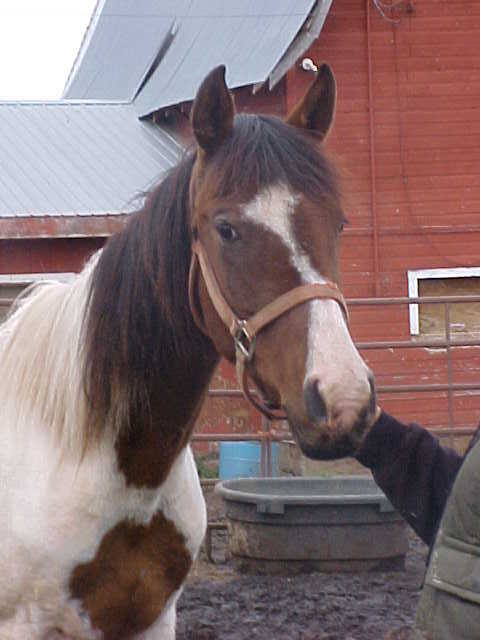 Poco is a feedlot rescue. These pics were taken on 8/12/07, about 2 weeks after we brought her home. 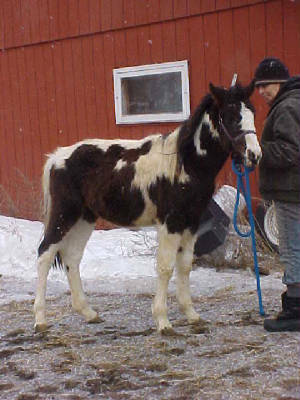 She is a sweet, sweet filly who is going to be a *big* girl when she finishes filling out. Out of all the horses on the farm, Poco is the one that gets the most excited about her grain. She's still got a ways to go but has put on a considerable amount of weight since these were taken. Poco on 10/8/07. Looking better, isn't she! 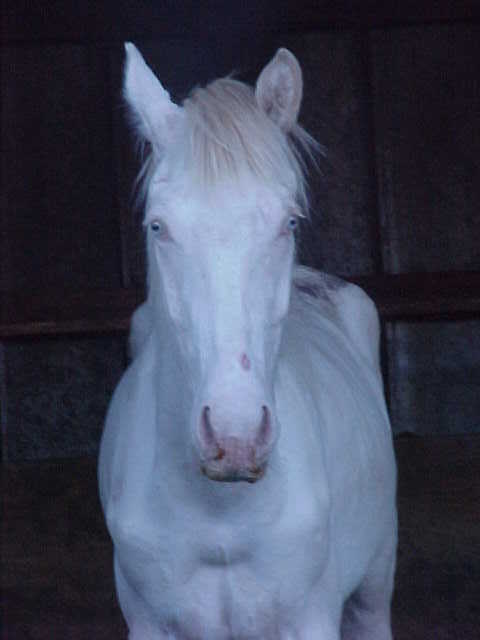 UPDATE: Poco has been listed on the "rescue horse" page as she is well on her way to looking good! She is nearly back to full weight and doing great!